Spider bites are reportedly rare in cats, but spiders can be fun "toys" for a cat and some spiders' bites are dangerous. What are the symptoms of spider bites in cats? Itchy, red welts can be raised by any insect bite, but what about those dangerous spiders---brown recluse or black widow? Immediate medical attention is the best chance your cat has of surviving a bite from a highly venomous spider, but first you have to be aware that your cat has been bitten. Cat skin is thicker than most spiders' fangs are long; only three types of spider in North America are known to cause serious damage with a bite: the black widow, one of many species of widow spider; the brown recluse, one of many spiders known as "brown spiders"; and the hobo spider. Symptoms arise long after the spider has bitten and left. The bite itself is painless. To discover which type of spider, you have to analyze the symptoms. Bites from a spider with neurotoxic venom---the widow spiders---will cause muscle cramping. This venom causes over-production of neurotransmitters, bringing on seizures in major muscle groups. The cat's muscles and abdomen will feel rigid, and breathing will become rapid and shallow. The diaphragm is a major muscle essential to breathing. Death can occur from seizure of this muscle and effects of the toxin on the heart. Bites from a spider with necrotic venom, such as the brown spiders and hobo spider, cause the breakdown of cellular structure. Tissue damage begins at the bite site, showing as an itchy, red lesion, often with a white ring surrounding it. Bluish or bruised-looking coloration indicates tissue death. This visual cue can go unnoticed until the venom begins working on deeper tissues. Once the cat has been bitten, symptoms may appear anywhere from 30 minutes to 6 hours later. In the case of a brown spider or hobo spider, the tell-tale white "bull's eye" pattern will appear within 4 to 8 hours. Symptoms of deeper tissue damage such as fever, vomiting, shock, kidney failure and internal bleeding may take 3 to 4 days to show. Muscle rigidity and pain from a black widow bite will last several days in a healthy adult cat and may take up to a month to fully clear. If the cat is going to die from a widow spider bite, experts say death can happen within one day of the bite. Widow spiders are common worldwide and can be found under things such as houses, woodpiles, rock piles, and inside garages and sheds. 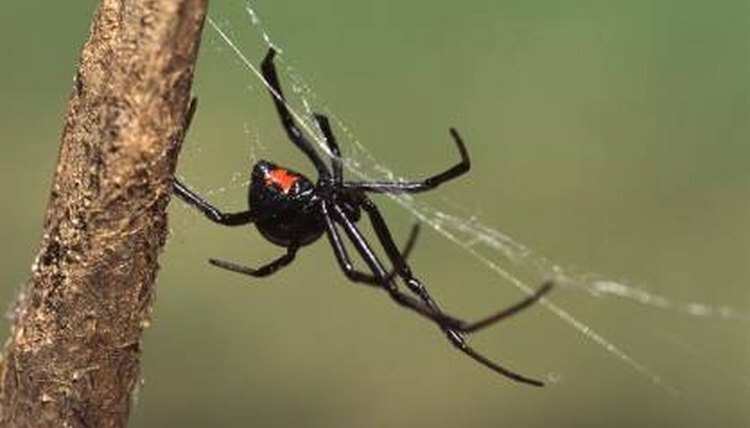 Species found within the United States include the common black widow, the western black widow, the red widow and the brown widow. Brown recluse spiders belong to a group of ten brown spider species in North America and are found from the south central Midwest to the Gulf of Mexico. Less familiar brown spider species occupy the Desert Southwest. Hobo spiders can be found in the western United States. A restless cat who licks a particular spot more than usual or shows other signs of unusual behavior related to itchiness should be checked carefully. Watch the cat closely for further warning signs. Look for a red, irritated patch of skin. These symptoms can indicate many issues, but if further symptoms appear such as the "bull's eye" pattern, seek veterinary attention immediately. With a widow spider bite, the cat may not indicate anything is wrong until muscle rigidity and paralysis set in, along with rapid, shallow breathing. Symptoms from hobo spiders, brown spiders and widow spiders are not limited to the site of the bite and quickly spread throughout the body. Be aware of the presence and possibility of venomous spiders in your area. Block your cat's access to spider-prone areas such as woodpiles and sheds, or keep your cat indoors. Spiders can come inside the house as well. If you choose to remove individual spiders yourself rather than calling an exterminator, do so carefully---the spiders' bites cause the same unpleasant symptoms in humans. Your veterinarian can administer pain relief and muscle relaxants to help your cat weather the effects of widow spider bites, especially if caught early. Antivenin is prohibitively expensive and is rarely administered, reserved for at-risk young or elderly individuals, but it can help in some cases. Full recovery can take up to a month. Application of ice packs to the bite location of hobo spider or brown spider bites can slow the venom's symptoms. Veterinarians will often use corticosteroid injections to slow or stop the tissue damage. The earlier this is administered, the better the chances of the cat's recovery. Drugs used for leprosy in humans can effectively fight necrotic spider venom. The cat may be put on antibiotics to combat secondary infections.